The construction of a new road will usually require planning permission. We welcome pre-application enquiries and will provide advice before you submit a planning application. Please note we may charge for this service. The street and highway network features and design are largely agreed through the planning process. All information and advice on the planning process, making a planning application and related issues such as urban design is available on the Planning section of this website. We fully embrace the highway design philosophies set out in the Manual for Streets (1 and 2) together with the Design Manual for Roads and Bridges depending on the nature of the road and its particular environment. We have adopted the Living Streets document as a technical guide to the implementation of informal home zones in new developments. 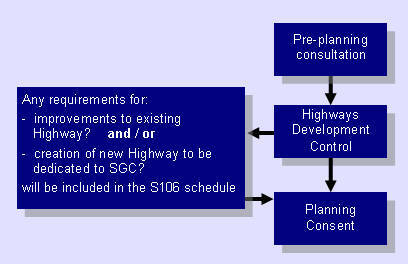 Planning consent is required before entering into a Section 38 Agreement for the adoption of a new road. For more information please refer to South Gloucestershire Council’s Draft Community Infrastructure Levy (CIL) & S106 Guide, see Section 106 planning agreements. Every person involved in construction work has health and safety responsibilities. Checking that working conditions are healthy and safe before work begins, and ensuring that the proposed work is not going to put others at risk, requires planning and preparation. This applies whatever the size of the site. The developer, designer and contractors must ensure that they are aware of their duties under the CDM Regulations 2015, and health and safety risks must be considered at all stages of the development, starting from the planning stage. The Health and Safety Executive provides guidance. If you have any questions about applying for either the adoption of new highway or the modification of existing highway please contact the Development Implementation team. Completed applications can also be sent via this address but please be advised that we cannot begin work on your project until we are in receipt of the £1,000 initial fee.